Canopy bedding This looks like a picture straight out of the queen’s photo album. 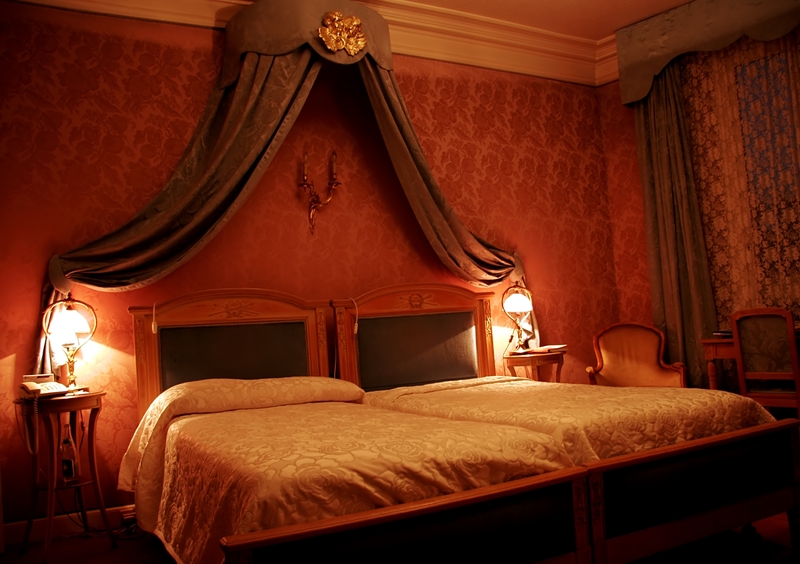 Graciously draped canopy bedding material cascades over the headboard giving the entire room a regal, majestic look and feel. The textured wallpaper, scalloped cornice, side panels, and lace sheer window treatment drive the theme home in grand style. 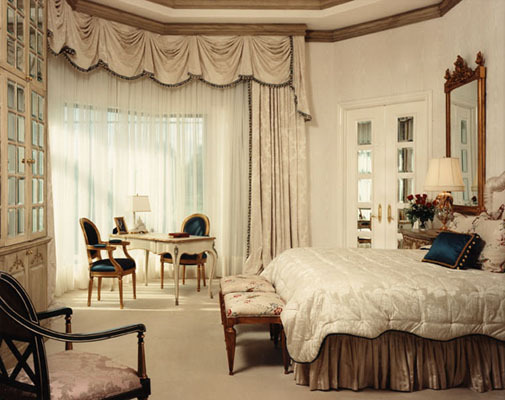 Drapes with top treatment bedroom The triple layering effect of a gathered valance above sheer curtains and side panels is made even more dramatic by the addition on a wood cornice that matches the crown moulding used throughout the bedroom. Luxury literally oozes from this setting accentuated by the elegantly curved lines of the sitting area table and chairs. 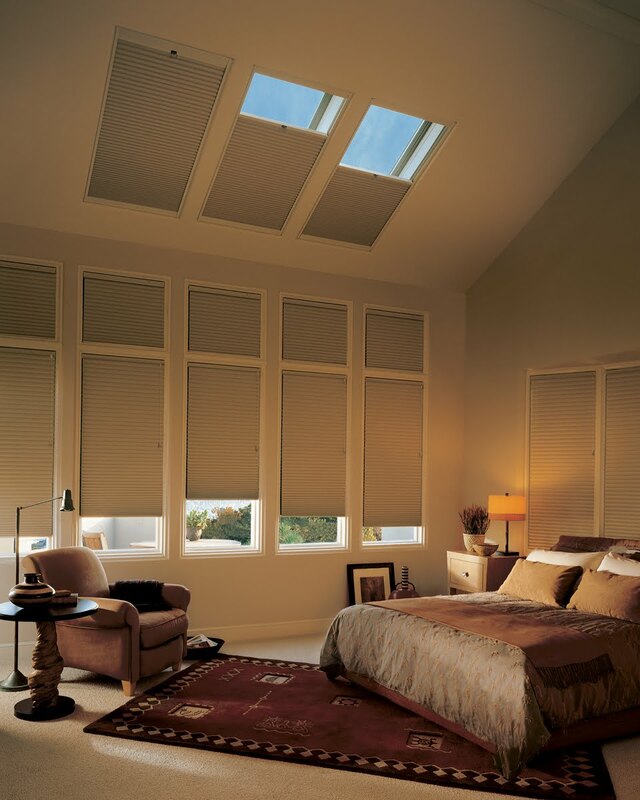 Honeycomb bedroom For nights full of romantic stargazing, simply open these energy efficient honeycomb skylight blinds and take in the wonders of the universe. Honeycomb window blinds allow complete blackout conditions for a perfectly uninterrupted night’s sleep and work well in this setting for their uniform coloring which offers a subtle flow to the bedroom’s decor. Ripplefold bedroom The use of magnificently contrasting black and white is not only dramatic but stunning and luxurious in this regal bedroom setting. Full length, white sheers let in softly filtered light while the black side panels not only offer the possibility of blackout conditions for a restful sleep, but play off of the carpet, lampshade, and bedspread. Room darkening roller shades bedroom The effect of black against light wood toned window frames is further enhanced by the continued floor wood tones and accented by the black head and footboards, chair upholstery, and magnificent throw pillow choices. 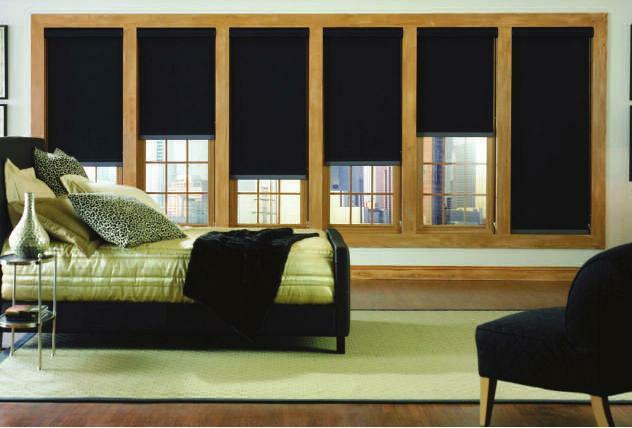 These room darkening roller shades allow you to totally block out any and all outside light for the best night’s sleep ever. 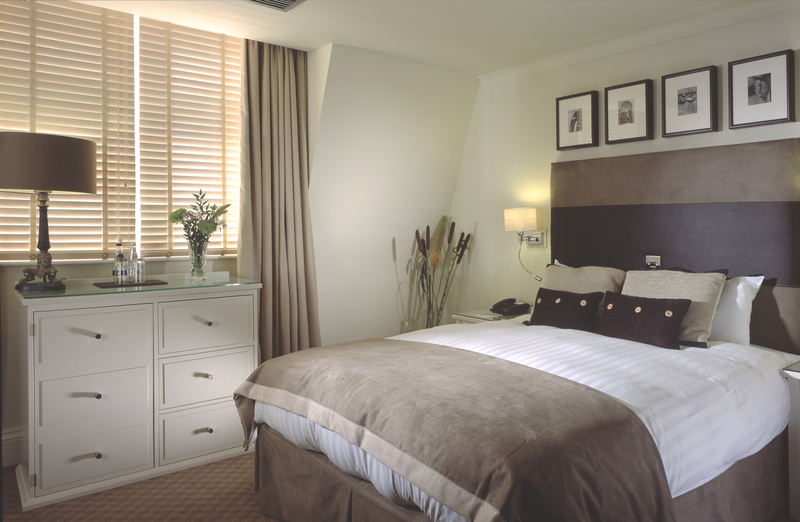 Shutters bedroom There can be no doubt that these dark wood-toned window shutters are custom fitted. In this setting, they play perfectly off of not only the furniture but the beautiful tray ceiling and fan. The choice of dramatic black and white animal print upholstery has a livening impact on the decor while the canopy bed curtains drive home luxury. 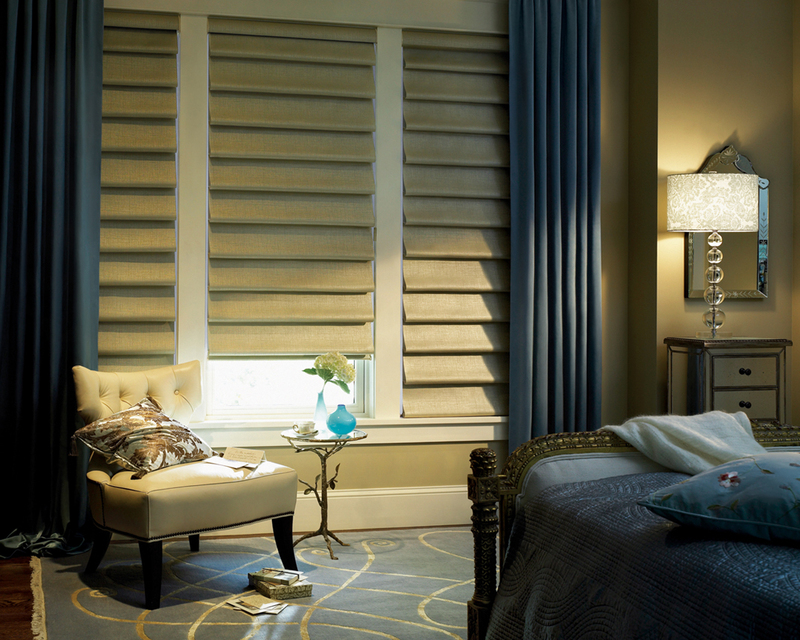 Vignette modern Roman shades bedroom With a lighter color on the window frame, baseboard, and chair upholstery, the choice of matching the Vignette Roman blinds and wall color in this bedroom is perfectly executed. Couple that with the blue accents offered by the side panels, bedspread, and rug and you have aesthetically soothing surroundings in which to lay your head every night. Wood blinds and drapes bedroom No crazy color combinations and wild accents for this bedroom… and that’s okay because the gentle, subtle tans, browns, and ivory colored wood blinds play so well off of each other that there is no need to confuse the flow of the room’s atmosphere. These blinds will let in only as much light as is desired. Woven wood shades bedroom Eco friendly natural shades such as these are hand woven from hand-picked reeds, bamboo, and grasses and, because of their neutral tone, fit perfectly with almost any color scheme. 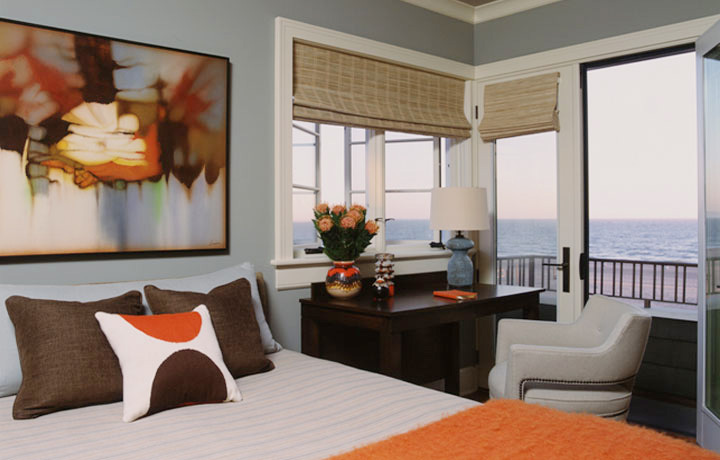 The oranges and browns in the color scheme of this bedroom are not interfered with by the tone of the window shades and are beautifully executed without being overstated.